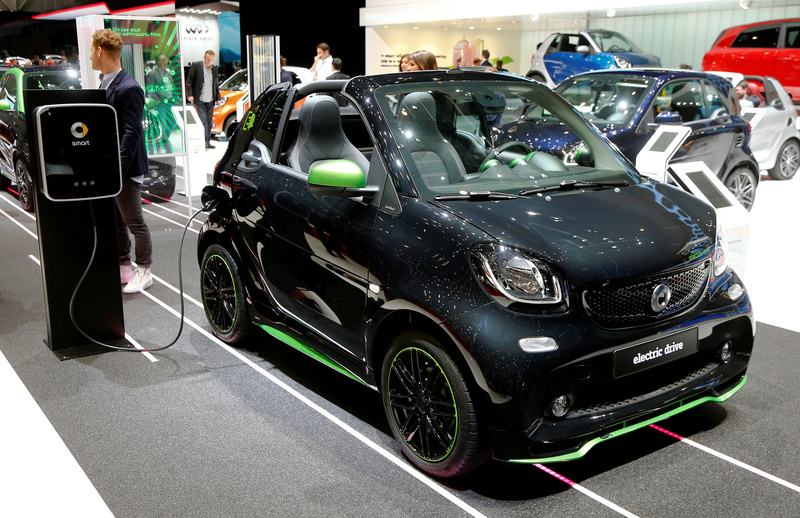 A Smart Fortwo Cabrio Electic Drive car is plugged at a recharging station during the 87th International Motor Show at Palexpo in Geneva, Switzerland, March 8, 2017. Daimler and Zhejiang Geely Holding on March 28 announced a joint venture to develop the German carmaker’s Smart brand in China. The venture will produce all-electric compact cars locally at a purpose-built factory from 2022. Daimler and Geely did not disclose financial terms of the deal. The details of the joint venture will be finalised by the end of 2019, the companies said in a joint press release. The two companies in 2018 set up a ride-hailing joint venture in China and Daimler Chief Executive Dieter Zetsche said in February that the German carmaker would deepen its alliance with shareholder Geely after Geely's chairman Li Shufu bought a 9.69 percent stake in Daimler in 2018.